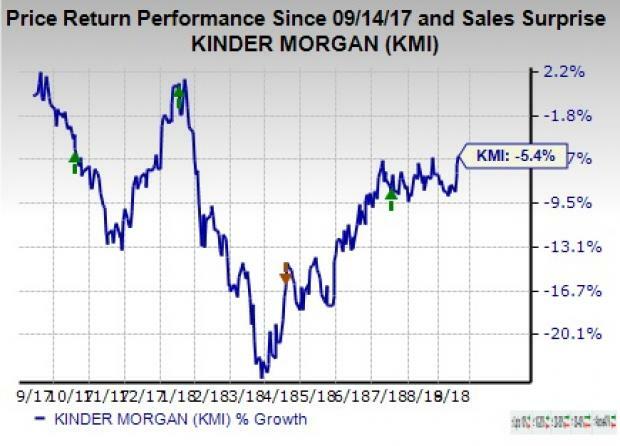 We issued an updated research report on Kinder Morgan, Inc. KMI on Sep 14. The company’s midstream properties are linked to all natural gas-rich plays in the United States. However, the company’s balance sheet is more levered than the industry. The stock currently carries a Zacks Rank #3 (Hold), implying that the stock will perform in line with the broader U.S. equity market over the next one to three months. Kinder Morgan has the largest network of natural gas pipeline in North America that spreads over almost 70,000 miles. These extensive networks of natural gas pipelines, for which the company has invested billions of dollars, provide it with stable fee-based revenues. In fact, Kinder Morgan generated significant cash flow from fees charged for using its midstream properties. The company expects annualized dividend for 2018 of 80 cents per share, reflecting a 60% increase from the prior year. Moreover, from 2019 to 2020, Kinder Morgan projects annualized dividend growth of 25%. On top of that, the midstream energy player has an ongoing $2-billion share buyback program started last December. The company has already purchased $500 million worth of stocks, reflecting its strong commitment to return cash to shareholders. However, we are concerned about Kinder Morgan’s weak balance sheet. As of Jun 30, 2018, total debt — both short and long term — stands at more than $37 billion. The debt capital is higher than the total equity capital of $34.5 billion which reflects the company’s significant exposure to debt. Moreover, over the past year, the stock has lost 5.4%. Prospective players in the energy space are TC PipeLines LP TCP, Petroleo Brasileiro S.A. or Petrobras PBR and Helix Energy Solutions Group, Inc. HLX, each sporting a Zacks Rank #1 (Strong Buy). You can see the complete list of today’s Zacks #1 Rank stocks here. TC PipeLines has an average positive earnings surprise of 3.7% for the last four quarters. Petrobras’ bottom line beat the Zacks Consensus Estimate in three of the trailing four quarters, the average beat being 10.4%. Helix Energy’s earnings exceeded the consensus mark in three of the last four quarters, the average earnings surprise being 66.7%.